After the registration process, you can start playing and stand a chance of winning in the games listed on the site. Lotto Sheli offers five types of lotteries which are the Social Lottery, Lotto, Chance, 777, 1.2.3. The social lottery is a new addition and offers three packages – the base pack, package pair wins and the extra pack. Each package has a different feature. The Lotto is divided into three – the Regular form, the systematic lottery and the powerful systematic lottery. The chance is also of three types – the normal chance, Rav Tzance and the Methodical choke. The 777 have three features to the 777, the systematic where the player can choose 8 numbers and the other systematic where the players can choose 9 numbers. The site is owned by Miphal Hapayis and operated by LottoSend limited. Some of the positive gains for the players include the complete transparency of their tickets, the fact there is no restriction upon the number of tickets players can buy thereby increasing their chance of winning and the options opting out and still have a full refund on the tickets that were not drawn. 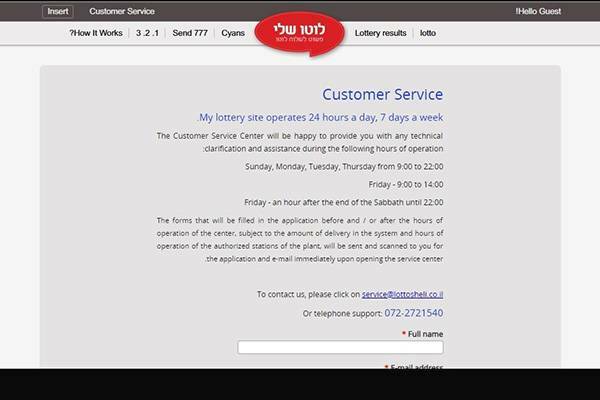 Some of the downsides to their services are that their lotteries are only open to the Israelis citizens and no international jackpot prizes. Lotto Sheli offer five types of lotteries which are the Social Lottery, Lotto, Chance, 777, 1.2.3. The social lottery is a new addition and offers three packages – the base pack, package pair wins and the extra pack. Each package has a different feature. The lotto is divided into three – the Regular form, the systematic lottery and the powerful systematic lottery. The chance is also of three types – the normal chance, Rav Tzance and the Methodical choke. The 777 have three features to the 777, the systematic where the player can choose 8 numbers and the other systematic where the players can choose 9 numbers. Their products include syndicate and single line and the feature are the quick pick and multiple draws. They do not offer any type of online games and there isn’t really much about their software. Lotto Sheli have a mobile app – iOS and Android – through which its users can access the website, they do not have any online games. There are no promotions offered on the site. The site is for Israelis and so also is the currency. For winnings of up to NIS 49,320, Lotto Sheli will collect it on your behalf and credit your account automatically and a message sent to you. But for amounts that are more than that, a credit card in the amount of that sum will be issued to the player. Payments can be made using credit cards whose details must be entered into the websites deposit link. Payments form is by credit cards which include Visa, Isracard, MasterCard and direct debit cards. The winning amount is subjected to withholding task. This is a review aspect in which Lotto Sheli shines, there’s a very easy to navigate and comprehensive FAQ pages that are divided into sections. It would be very helpful for players who are in need of some basic troubleshooting and general questions. Customer Support is available through phone number, email address, and contact form. It is also stated clearly when each channel is operating, and I can say that operating hours are pretty much correlated with waking hours. Most issues raised at 2:00 AM could wait a few hours for a live representative. Is Lotto Sheli legit or fraud? 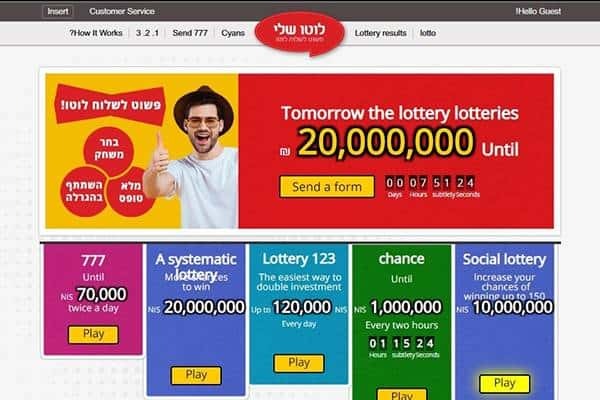 There is really not much about the website online, but if you happen to be an Israeli citizen you can always give it a trial at least it might be better than walking all the way down to the store just to play your lotto game. They don’t have any jackpot and there is no address on the site, so if you played and won more than the stated amount which they can automatically credit your account with, there is no valid address where you can go and collect your money. But their customer services as stated on the site are always available. 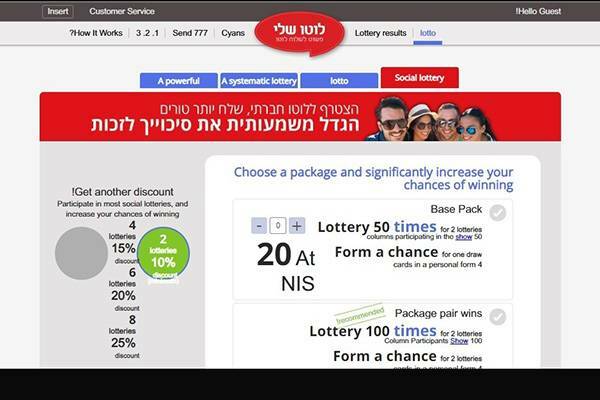 For Israeli citizen, the easiest way to play lottery from the comfort of their home without having to do anything much is now available. 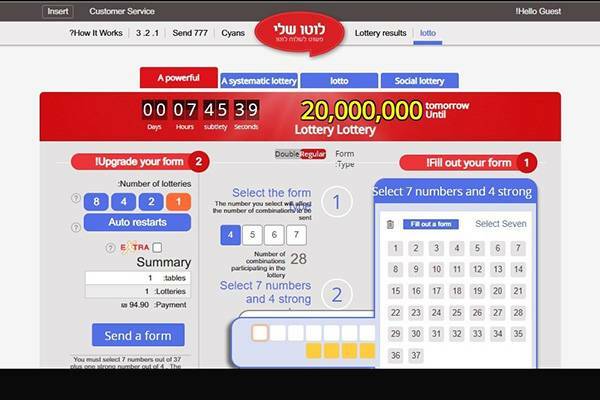 They stand a chance to win amazing cash prizes in some of the most famous types of lotteries in Israel. Lotto Sheli provides a platform for Israeli citizen play and wins in different types of lottery all you have to do is visit the website and register.